As a follow-up to last year’s highly popular edition, Kitco Metals Inc. has issued its 2010 Signature Silver 1 oz Round — www.kitco.com/silver. 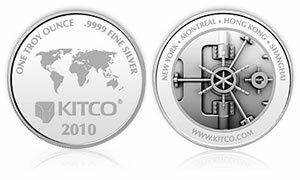 Like its earlier 2009 version, the 2010 Kitco 1 oz Silver Round is a work of exceptional purity with its .9999 fineness. The difference however, lies in the design. The face of the 2010 edition features a high security vault, making it a striking addition to Kitco’s family of products. "The exciting new design makes the 2010 Kitco 1 oz Silver Round more desirable than ever before," said Bart Kitner, president of Kitco Metals Inc. "And as usual, should our customers choose to sell it, we will buy it at the spot bid price current at the time. Add to this the competitive price at which we are offering it, and you have an irresistible investment product," said Mr. Kitner. A vault was chosen as the round’s motif because Kitco prides itself for and believes in keeping customers’ assets secure. The vault also represents another new offering from Kitco — the Kitco Recognized Storage Facility option. Through an arrangement with leading suppliers of high-value asset transportation and storage service providers, customers can have their assets shipped and stored securely by expert professionals. Founded in 1977, Kitco Metals Inc. is one of the world’s premier retailers of precious metals and a leading provider of refining and recycling services to industrial customers and jewelers. A mainstay of Kitco’s business is the award-winning www.kitco.com. Featuring live spot prices, market commentaries, news and usable market information, the website attracts about a million unique visits every day. From its offices in Montreal, New York, Hong Kong and Shanghai, Kitco provides top-quality products and services that are trusted by customers worldwide.